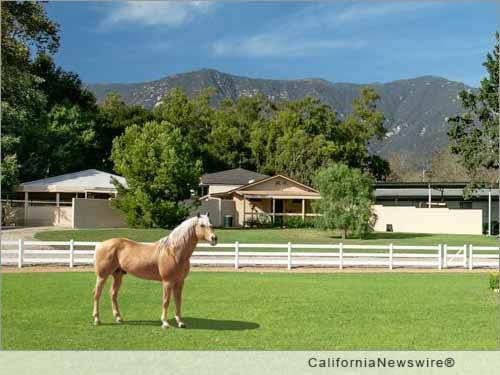 MONTECITO, Calif. /California Newswire/ — It's the luxury real estate opportunity of a lifetime. The Semair Farm Estate located in Montecito, Calif. is available for the first time in nearly 40 years and sealed bids are due by Nov. 18 via Sage Auctions LLC. Located in the city that Forbes Magazine named as having the most spectacular and expensive real estate in the U.S., Semair Farm is now available and waiting for its next family to create a legacy and dreams of their own. The prior owners of this property, Mary Dell Olin Pritzlaff and John Charles Pritzlaff, Jr., developed this elegant sanctuary with careful attention to its many assets. Purchasing this unique property in 1977, the couple began to develop its 23-plus acres, surrounded by spectacular views of the Santa Ynez Mountains and the Pacific Ocean, into the beautiful and comfortable family sanctuary it is today. Renovations to the substantive barn and training facilities allowed Mary Dell to show and raise champion hackney ponies, gaited horses and long tail ponies. John enjoyed the property in a different way. He chose to exercise his encyclopedic gardening knowledge and skills to create a truly magical transformation. With their passing, this beautiful property can now become a sanctuary for another owner, who is sure to find the property to be a unique and open canvas ready for new visions and passions. In the heart of Montecito, Seamair Farm is one of the largest properties in the area. The property is only 90 minutes from Los Angeles and Hollywood, so it offers a rare blend of privacy and convenience to all that Montecito has to offer. It is bordered on the north by a 40-plus acre, world-class estate, and on the east by a 44-acre dedicated preserve. The main home, designed by renowned California lifestyle architect, Cliff May, is 4,750 square feet with four bedrooms and four and a half baths and has four fireplaces. With its gentle Mediterranean climate, Montecito has long been a desirable location for nurserymen and gifted horticulturists. March and April are the months to watch gray whales migrate north from Mexico through the Santa Barbara Channel. Many celebrities call this city home and include: Oprah Winfrey, Jeff Bridges, Rob Lowe, Ellen DeGeneres, Drew Barrymore, Megyn Price, Eric Schmidt and others. "We are honored to have been selected as the sales team for such a prestigious and one-of-a-kind property," Marty Rogers, president, Sage Auctions says. Initial bids are due no later than November 18, 2015, at 5 p.m. The high bid may be accepted immediately or a group of high bidders may be invited to participate in a second round of bidding at a live private auction or by bidding online in simulcast during the live auction. This auction, if necessary, is scheduled for November 23 at 1:30 p.m.
For more information on the bidding process and property information, to request a bidding packet and instructions or to schedule a tour, contact Alan A. Armstrong at: 805-335-7106 or visit: http://www.sageauctions.com/. Marty Rogers, principal, Sage Auctions is a second-generation auction company deploying a proprietary process that delivers true value for high value estate properties. Sage has conducted more than 3,000 auctions representing hundreds of millions of dollars in real property assets throughout the United States, Canada and Europe.